In addition to using my pressure cooker more, I set another cooking-related New Year's resolution this year: use my cookbooks more. Like a lot of avid home cooks, I have a nice, varied collection of cookbooks ranging from all-purpose favorites like The New Basics by Julee Rosso and Sheila Lukins, which was my first favorite cookbook, to more specialized works like Melt by Stephanie Stiavetti and Garrett McCord, which focuses exclusively on macaroni and cheese. Yet, when I get an idea to make something specific, I generally turn to Google to find a recipe while my cookbooks remain sadly underutilized. So I set a goal to make something new from one of my cookbooks at least once a month. 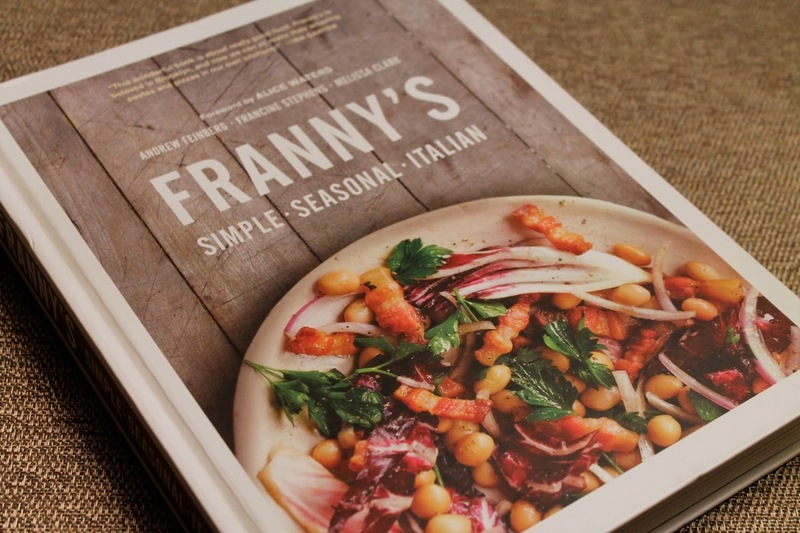 That resolution found me thumbing through Franny's Simple Seasonal Italian by Andrew Feinberg and Francine Stephens, owners of the celebrated Franny's in Brooklyn, with an assist from New York Times food writer Melissa Clark and a foreword by Alice Waters. This was one of last year's most acclaimed new cookbooks. It covers a lot of ground from starters and salads through pasta, pizza and dessert. There's even cocktails. Seeking a good pasta and salad combo for dinner, I made Spaghetti with Chickpeas accompanied by Celery, Fennel and Pear Salad with Pecorino. The pasta is wonderfully simple and flavorful and something you can make in the winter. The recipe called for cooked chickpeas, which Feinberg and Stephens make with dried chickpeas, but to further simplify the dish, I used canned. Frying them in olive oil enhances their nutty flavorful, while making them a bit crisp. The anchovies really do melt away as they cook in the oil. It's pretty cool to watch. 1. Bring a large pot of salted water to boil. Cook pasta according to package directions 2 minutes shy of al dente. Drain and set aside. 2. Heat 1/2 cup olive oil in a Dutch oven or deep-sided sauté pan over medium-high heat. Add chickpeas and cook without stirring until browned on one side, about 3 to 5 minutes. Add the remaining 1/4 cup olive oil and garlic and cook until the garlic is fragrant and lightly golden, about 2 minutes. Add the anchovies and use a wooden spoon to mash and stir them into the oil until they dissolve, about 1 minute. Add the red chili pepper flakes and cook for another 30 seconds. Carefully add 2 tablespoons of water to the pot (it will sputter). 3. 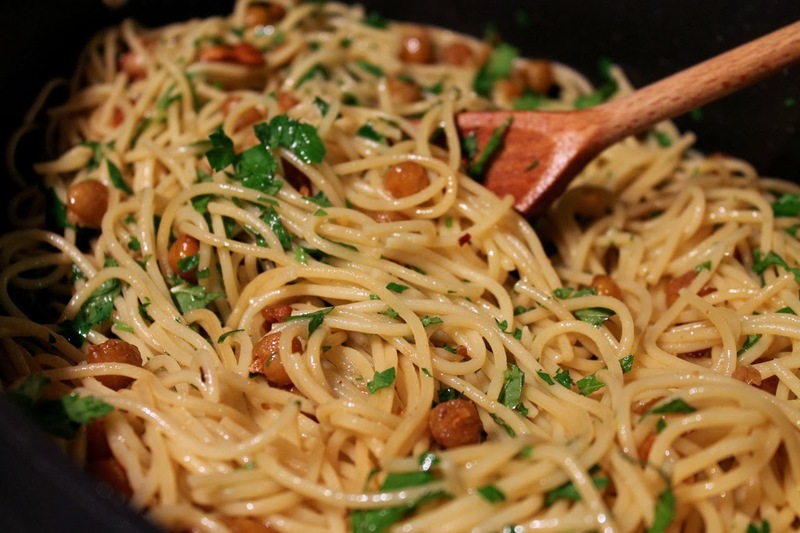 Add the spaghetti, chopped herbs and pepper to the pot and toss to combine with the chickpeas and sauce. Cook an additional 2 minutes until the spaghetti is al dente. Add lemon juice and season with salt to taste. Serve on plates or in shallow bowls. 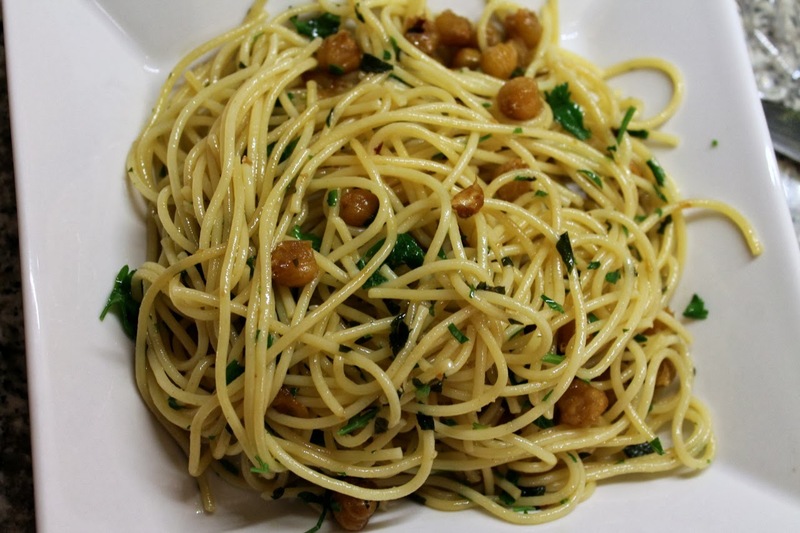 I love spaghetti, I love chickpeas and I love them together. Brilliant combo. Thank you for making this dish!